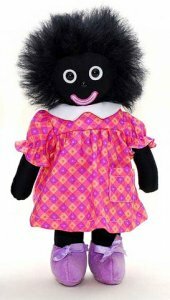 10", 2008, Black cotton fabric body, black plastic eyes with white felt backing, pink and white embroidered mouth, plastic button nose, mohair hair. Betsy is dressed in a little pink, purple and orange diamond print cotton dress with a white cotton collar. Pattern is the same as Bobby's pants but different color combinations. Purple velvet shoes tied with purple satin ribbons. Non jointed and will stand alone.